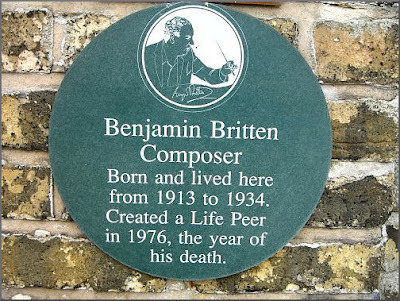 Benjamin Britten was born in the house seen in these photos on November 22nd, 1913. 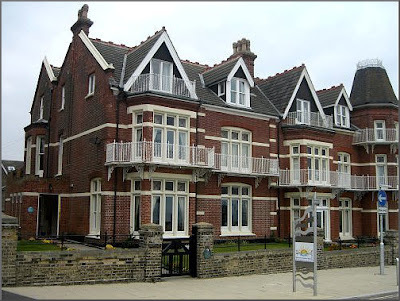 The house is 21, Kirkley Cliff Road, Lowestoft in Suffolk. It was Britten's home until 1934, by which time he had composed his Simple Symphony op. 4, based on music written in the house between the ages of nine and twelve. 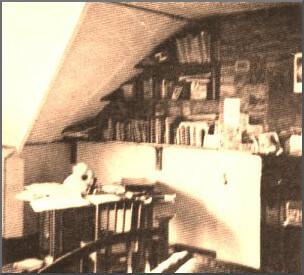 The photos above shows the attic room that was Britten's bedroom for twenty-one years, and it is here that he composed much of his early music. The top photo shows the room today; the lower one was taken by Britten himself in late 1934. On the writing desk, where he composed, can be seen a small bust of Beethoven. The North Sea, with its many moods, is a leitmotif that runs through all Britten's music. 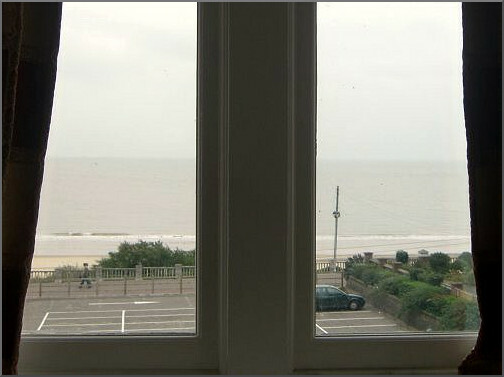 The breakers can be heard from his bedroom, and the photo above was taken by me looking out to the shore on a typically grey and murky autumn day. 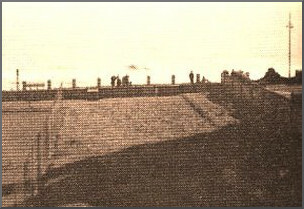 Above is the same view photographed by Britten himself in December 1934. The view to the sea is the same, but 'progress' hadn't yet claimed the area between the house and the sea as a car park. This photo shows the exterior of 21, Kirkley Cliff Road, or Britten House as it is now known. 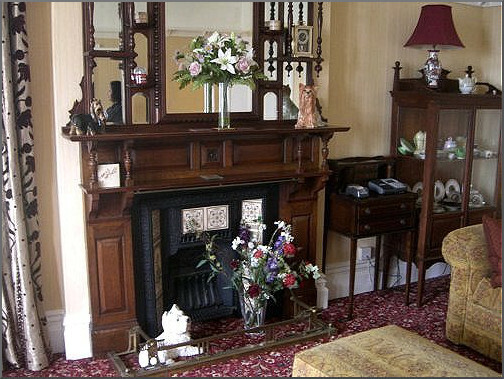 The Grade II listed Victorian townhouse was bought by Ann and Colin Ceresa several years ago and is now a five star guesthouse after complete renovation. My photographs are the first glimpses of Britten's childhood home after its restoration to its former glory. This photo shows the house seen from exactly the same viewpoint at the time that the Britten family lived there. Robert Britten, Benjamin's father, was a dentist who built up a substantial practice at the house. 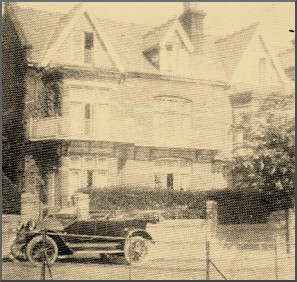 21, Kirkley Cliff Road remained a dentist's surgery after it passed out of the Britten family, and dental equipment was still in the house when it was purchased by its present owners. 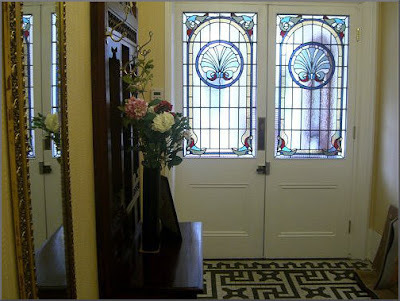 The listed house retains may original features, as can be seen from my photo of the entrance hall. 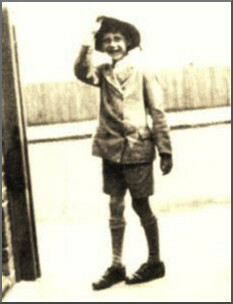 This photo shows the fifteen year old Britten leaving for school through the same entrance hall. The drawing room is now the breakfast room for the guesthouse. In Britten's day the drawing room housed the all important piano. 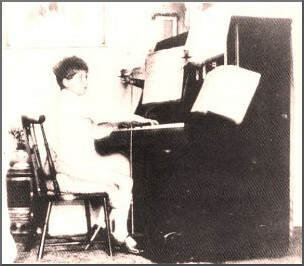 This undated photo shows young Benjamin at the keyboard. His prodigious talent is already evident as he is playing four scores simultaneously. This is another photo of the house which was Britten's home throughout his education. Although he was a boarder at Gresham's School in Holt, Norfolk and at the Royal College of Music in London, Lowestoft remained his home base until he started work with the GPO Film Unit in London in 1935. 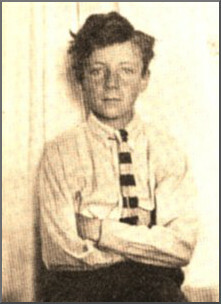 The photo below of schoolboy Britten was taken in the house when he was aged around eleven. It is wonderful that 21, Kirkley Cliff Road has not become a stuffy museum. Under Ann and Colin Ceresa's ownership it remains a working and welcoming home, and one that can be enjoyed by Britten's many admirers around the world. Benjamin's bedroom is one of the eight comfortable guestrooms. 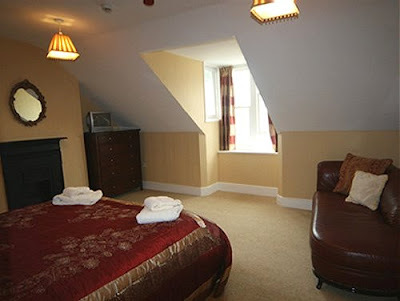 Visit the Britten House website for more details and tariffs. I would like thank Ann and Colin for giving Overgrown Path readers this exclusive view inside Benjamin Britten's home as we celebrate his birthday. Republished from November 2008. All contemporary photos are (c) On An Overgrown Path except the header which is courtesy of Britten House, Lowestoft. Any copyrighted material on these pages is included as "fair use", for the purpose of study, review or critical analysis only, and will be removed at the request of copyright owner(s). No complimentary remuneration received for writing this post. Also on Facebook and Twitter.